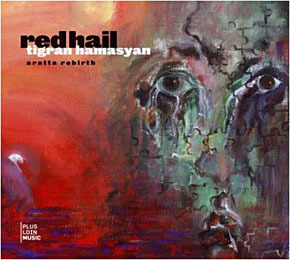 As announced in the last post and with for pretext his concert tomorrow, Sunday the 12th of July in Paris Parc Floral, it will be a piece of Tigran Hamasyan « Sibylla » published on the record called « Red Hail -- Aratta Rebirth » that we are going to listen to today. - the use of the voice as an instrument by itself, without word, singing the melody (1:01) or to its service as an accompanist (eg 1:50, 2:30). Find the article on Shema by Pierre de Bethmann who also uses the voice in this way. - chains of themes and more or less decomposed measures which make lose the balance of the listener, we even wonder how musicians manage not to vacillate (1:59). Find the article on Lingus by Snarky Puppy for another example of this type. But my favorite passage is a mixture of all of this at 4:47: rock hammering by the drums, the bass, the piano and an additional keyboard a little deconstructed to emphasize it even more (Tigran plays certainly a hand on each keyboard), the voice and the saxophone in a sound layer on the top and a total loss of rhythmic mark at 5:05 when the drums begin to mark a tempo which seems totally different or slower. © 2012 La Zik à Beber. All Rights Reserved.